Last Fall when the editor of Cottages and Bungalows, Malena Jaime, contacted me about their new magazine coming out the first of this year, I had no idea we would be leaving behind my favorite spot, the sunporch. She had seen my post on my "Patriotic Sunporch" from early July and wanted to know if I would be interested in being a part of their first edition of the magazine. What? Who me? well of course! Between the Holidays and a slew of bad weather, I finally located the magazine at WalMart, and wow, what an amazing honor and surprise!! 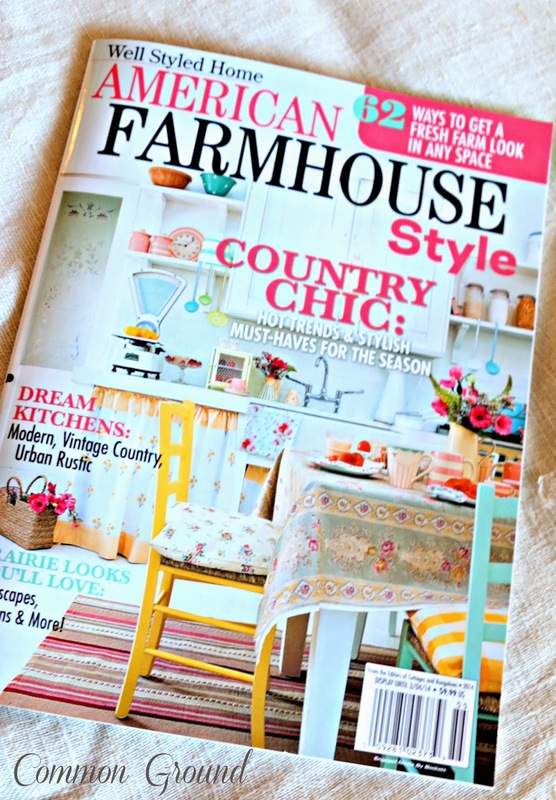 Dedicated to Farmhouse Style, I wasn't sure how my "80's" sunporch would fit in, but their magazine is all about the style, and how to adapt it to wherever you might live. Tips and ideas I shared go for a new house or an authentic antique farmhouse; wherever you call home. This magazine is full of wonderful features and beautiful photos from a wide variety of personal homes and spaces. American Farmhouse Style shows that there are many interpretations of "Farmhouse Style"; from rustic to industrial, cottage to romantic, there's something for everyone to enjoy and identify with. My little ol' sunporch feels pretty darn special! but I plan on taking a little "farmhouse" with me wherever I go. Thank you so much, Malena, for including me in your premier issue! 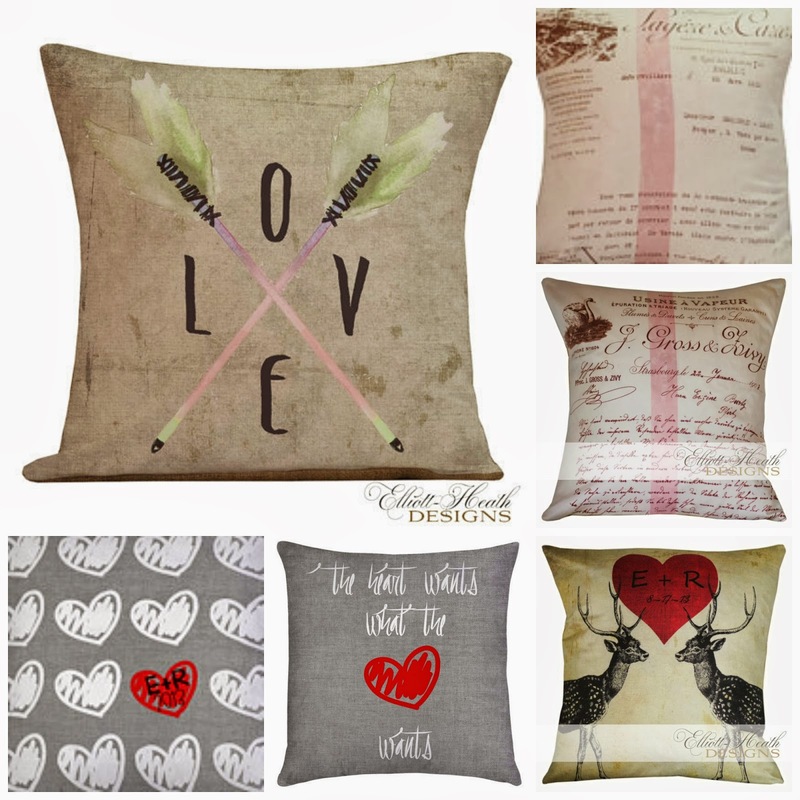 Need a "special something" for a Valentine? I saw your feature. Congrats! Congratulations!!!!! I just picked up a copy! Congratulations! I remember that post and loved your sun porch! How wonderful for you, and for your readers to see more of your wonderful last house. I'm going to look for a copy tomorrow. Thanks for the heads up. Congratulations on having your sweet sun porch featured! Well, this is SO fun, Debra! I can't wait to see it! It's wonderful you'll always have this issue to look back on! A BIG Congratulations! this is great~! Congratulations.. your porch was and is lovely . I bought the magazine, Debra! Loved your feature! Congrats! That's wonderful, Debra! I will have to look for it now. How often do we tell you that your sunporch belonged in a magazine. : ) I think this is especially wonderful because you are leaving it behind in your move. Congratulations Debra! I am not the least bit surprised that they featured your gorgeous sunroom.every room in your home is magazine worthy. Enjoy! CONGRATULATIONS! To me, you are adjusting to life's changes like a trooper! I can get a bit crotchety in times of change. Congratulations! How exciting for you. A better porch could not have been found for their first issue than your beautiful space. Even though you will soon have to leave your special place, your talent and fabulous style you can take along. I have no doubt you will very quickly carve out another special spot that is all "you". Congratulations Debra! Wow! How exciting that must have been! Your sunporch is beautiful! I'll be sure to buy it this weekend! Congrats, love the beautiful picture, you should be so proud ...just make sure you buy a lot of mags to save...loved the post and loved your sunporch, thanks for sharing. Wow! Will certainly have to look for that one! I saw this on the news stand the other night but did not pick it up...I didn't know you were in it! I'll check it out tomorrow when I go back to the store. Congrats!!!!! Congratulations, Debra! It's great that your special place was featured in the magazine. I can imagine that it was hard to leave your beautiful sunporch behind. The magazine is a wonderful keepsake. So happy for you! You deserve it. Thanks for sharing so many inspiring ideas! I knew it was only a matter of time before you were famous. lol! Seriously, you well deserve being included in this magazine! I must head to Walmart and get it tomorrow. Congrats! I too loved your sun porch. You will miss it, but I know you will find another special spot! Congrats Debra!!! I remember that setting on the porch last year, loved it...will look for the mag this week!!! My good friend Julie said it best. I am so thrilled for you. Your sun porch will always be a wonderful image for us to remember! I can't wait to find a copy of this magazine! Congratulations, Debra!! It looks like a beautiful magazine and I'll keep my eye out for it on the shelf! Your sunporch has set the bar for all the issues to come for this new magazine. I love your sunporch and this particular arrangement is my favorite. I love that stack of red & white transfer ware sitting atop that little blue lunchbox/toolbox. Such a fresh expression of red, white, & blue! Congrats to you! I'll have to look for the magazine, your sunporch looks just wonderful ! Debra, what wonderful news; congrats, you deserve it!! Congratulations! I will be on the hunt for this magazine! Congratulations Debra, Your little ol' sunporch IS pretty darn special! I'll be looking for the issue! Your sunporch is/was amazing, dear friend!!! I, too, adore your July / Patriotic theme! Your dress form, "Lady Liberty", is one I have swooned over the most of any dress form decor e v e r!!! Thanks for sharing this amazing news and publication! Love the magazine and your feature, congrats! Congratulations!!!!! You have the "touch" when it comes to decorating!! Enjoy looking at your pics in the past & present! Congratulations, Debra! I'll be sure to look for the magazine when I'm out and about this weekend. Congratulations, Debra! 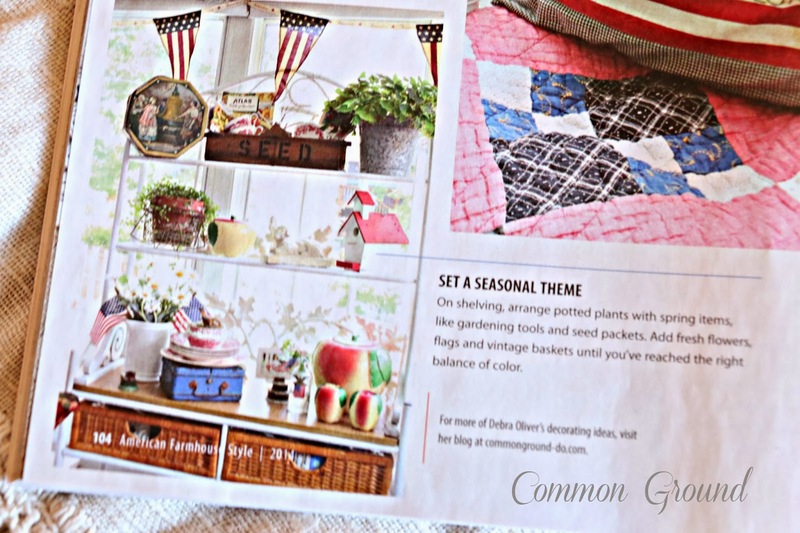 Your patriotic porch was stunning and so deserving of a magazine article about it! Wow Debra how cool is that! I always enjoy seeing how your porch is decorated. I will look for the magazine the next time I get out. Thanks for sharing! I just got a copy yesterday and as I flipped through your pages, I thought, "I know this porch from somewhere!" And now I know! Congratulations, it's gorgeous! congrats, debra! love that magazine:) happy weekend! Congrats Debra. 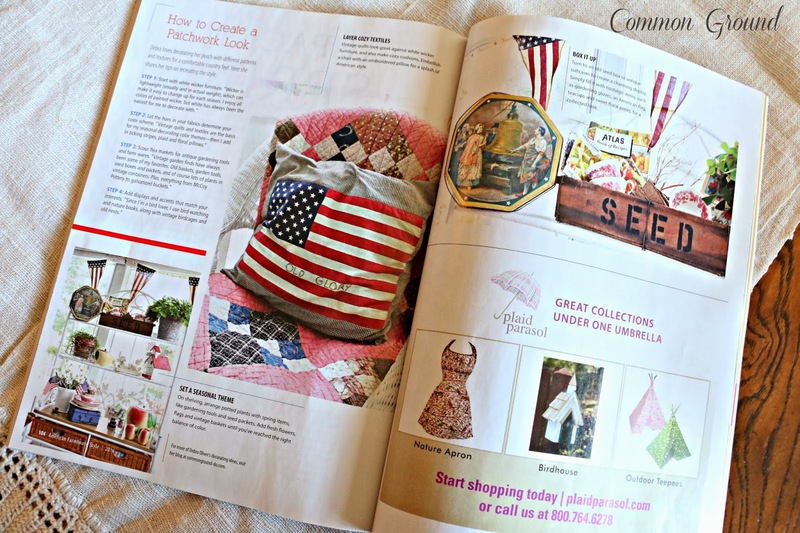 It is a beautiful Magazine and Lynn from Shabby Story gifted that issue to me and I love it and I was excited to see you in it. Your porch was so pretty for the 4th. Congrats to be in the premier issue. Congrats! Can't wait to get the magazine!!! How absolutely thrilling, not to mention well-deserved. Well, isn't that special? I know that you will miss that porch, BUT you will create something beautiful again:) Have a blessed weekend dear Debra, HUGS! Congrats on the feature! Especially in a brand spanking new magazine! I can see I'll have to have that. It's everything I like. And I'm trying hard not to buy anything. Lord, I'll have to hunt it down now. What a lovely way to remember your beloved home! Wherever YOU are, you will make it beautiful, and home. Kudos on the feature and your new adventure. Congrats on the feature Debra!!! I have always loved your sunporch and I see why she wanted to include it in the first issue. Aw Debra, I know you will miss your lovely sun porch, but I also know how gifted you are at styling! You will no doubt have a space every bit as charming where you are now. And after all, we come back because we love you and your style!! And you take that wherever you go!! Such a lovely feature...even a lovelier lady behind it all!! I picked that magazine up and I thought that was your sun porch. Congratulations on the magazine feature. I'm going to look for a copy. Congratulations! And I have faith in you: you'll make a place beautiful wherever you are! Congratulations Debra! What an honor to be featured. I was standing at the magazine rack at JoAnn Fabrics one day browsing through their magazines and I saw that you were featured, but I think it was a different magazine than this one. I can't remember now what magazine it was, but I thought to myself, "I know this lovely lady." No one deserves it more. I have that magazine and saw your sun porch featured. Congratulations! It looks so charming and deserved to be featured! That's a great magazine. Debra,CONGRATULATIONS AND KUDOS! I adore farmhouse style! Your sunporch does it best! Can you come and decorate my family room. You have nailed the look I love! Your 4th of July sunporch from 2012 is the first time I ever visited your blog and I was hooked from that day. Now I have to go hunt down the magazine. 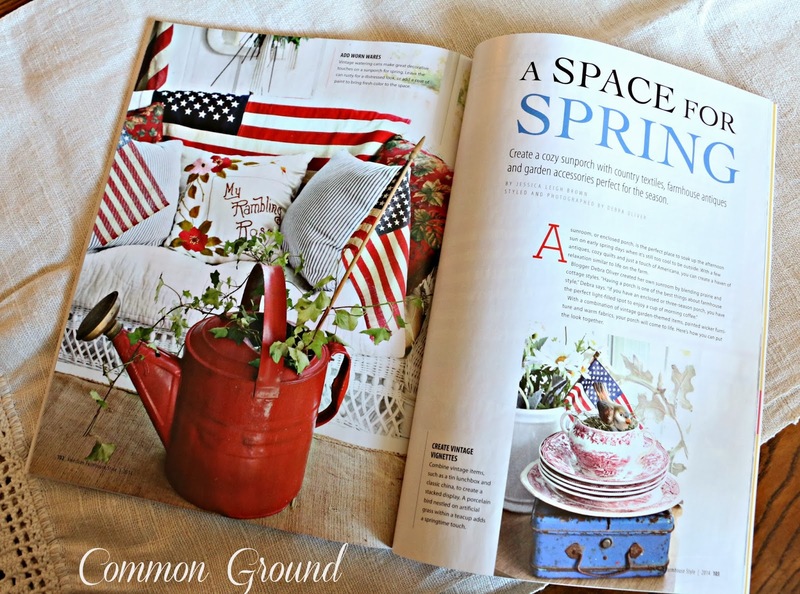 I just love our sun porch and so happy for you that it landed in the very first issue of the magazine!…I am off to see if I can find a copy!…Congrats Debra!…so well deserved! You Rock Debra!!! So proud of you and your beautiful porch. Congratulations. What a bittersweet joy! Angels to you. Congratulations and well deserved! So happy for you! How wonderful Debra. Your sunporch was a favorite of mine. It looks beautiful in this magazine. I haven't seen that magazine yet. I'll look for it.